White Lake Provincial Park is situated on the north shore of White Lake. It has a reputation for excellent recreational rainbow trout fishing – it is one of the top three angling lakes in the province in terms of angler days. White Lake is popular for fly fishing and trolling in the summer, and also for ice fishing during the winter. Facilities for camping and boat launching are limited – there are two pit toilets, a gravel boat launch, and an old picnic shelter. The lakeshore is suffering from extensive damage. Please launch your boat in the main launching area only. The camping area is undeveloped and suited mostly to self-contained truck-and-camper visitors. The nearest public telephone is at Balmoral, 10 km away. Camping is only permitted in the designated campground. Please obey all signs within the park. ATVs are prohibited in White Lake Provincial Park and are not to be operated in the park boundary. Painted Turtles: White Lake is home to the intermountain-Rocky Mountain population of the Western Painted Turtle (Chrysemys picta bellii).The Western Painted Turtle is the only native pond turtle left in British Columbia and therefore makes up an important component of our biodiversity. Painted Turtles typically occupy the shallow water zones of ponds, lakes, sloughs and slow moving streams. You can easily find Painted Turtles basking on partially submerged logs during warm sunny days. During the breeding season pregnant female turtles leave their aquatic environment in search of loose, warm, well-drained soils, typically south facing. These movements typically occur in late afternoon periods and during the onset of dusk. In spite of being our only native turtle, the Province of British Columbia classifies the Western Painted Turtle as vulnerable to extinction due to habitat loss and degradation and through collision with automobiles during the nesting season. Opening and Closing Campground Dates:(campground is accessible but may not offer full services such as maintenance, garbage pick up, security, etc.) April – October. Gates are closed once the lake freezes over or winter conditions limit access. Gates open in the spring when ice comes off the lake, and road conditions permit safe access. Note: The above information is for the campground only. Park users can still walk into the park if conditions such as weather permit. Check the “Attention Visitor Notice” above for park alerts. The park is located approximately 10 km northeast of the Trans Canada Highway from Balmoral (west of Salmon Arm); the last 2 km is on a logging road. Balmoral, White lake, Tappen, Sorrento and Salmon Arm are the communities that are close to the park. The management plan for White Lake Park was approved in January 2014. A pleasant place for canoeing and small boats. The lakeshore is suffering from extensive damage, so boaters are requested to please launch their boats in the main launching area only. Fly/troll for Rainbow Trout to 5kg. Experienced chironomid anglers do well in early spring. Also in the spring a good mayfly hatch is productive. In July try gomphus or dragonfly patterns. Anyone fishing or angling in British Columbia must have an appropriate licence. There is access to the lake for ice fishing until the snow makes the entrance road impassable. Please do not light fires on the ice as it adds pollution to the lakes. There is not a designated or protected swimming area in this park. Please use caution when swimming due to boat traffic. There are no lifeguards on duty at provincial parks. An undeveloped boat launch area is suitable for small car-top type boats only. The lakeshore is suffering from extensive damage, so boaters are requested to please launch their boats in the main launching area only. While campfires are allowed we encourage visitors to conserve wood and protect the environment by minimizing the use of fire and using campstoves instead. Firewood can be purchased in the park or you may bring your own wood. Fees for firewood are set locally and may vary from park to park. Limited burning hours or campfire bans may be implemented. To preserve vegetation and ground cover, please don’t gather firewood from the area around your campsite or elsewhere in the park (this is a ticketable offence under the Park Act). Dead wood is an important habitat element for many plants and animals and it adds organic matter to the soil. Although there are no designated campsites, the park is suitable for self-contained small truck-and-camper rigs. 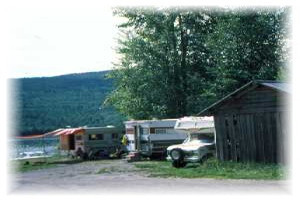 The camping area is small making it difficult for larger units and trailers to maneuver for parking. This area would be considered a high-density campsite for approximately 10 units. There are no tables provided. The trees surrounding the parking area provide some shelter. The campground is open for off season camping until the gates are locked once the Lake freezes over or winter conditions limit access. The 14 day camping limit for visitors still applies.